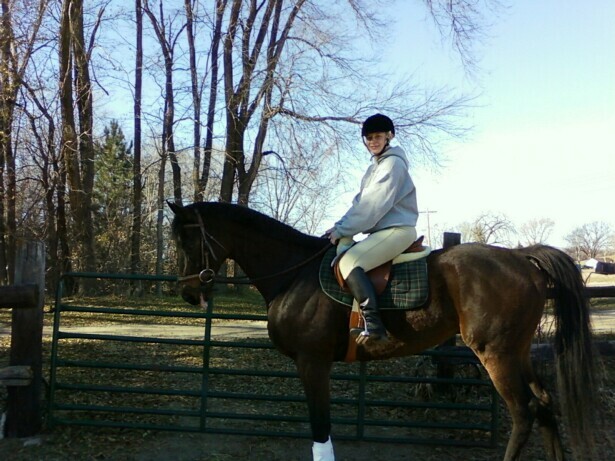 Amy Atkins first ride on her OTTB Bank President. So its been a busy couple of weeks out on the farm. My TB mare finished her last show of the season with “flying colors”. Banker and I have had our first ride which was fun and interesting. It feels like a long way up when you sit on him, thankfully I stayed up there = ). He took the first few minutes to show me what a “feel good” horse he is and I showed him that its not my first time. After the “show and tell” time we settled into a nice trotting circle. That is pretty much all we’ve been able to do as he is still recovering and I don’t want to push it with him. Its a very nice trot though. He is doing well with the other horses and they are finally all out together which is nice. He has continued to get massages (lucky) and lots of R & R. More to come soon when we are able to canter!